Does anyone play this tune? I came across it recently on a Jethro Tull compilation and I've been having a bit of fun with it, but having decided to have a serious go at it I'm having trouble with the music. The 1513 manuscript shows three verses, all with different tunes. 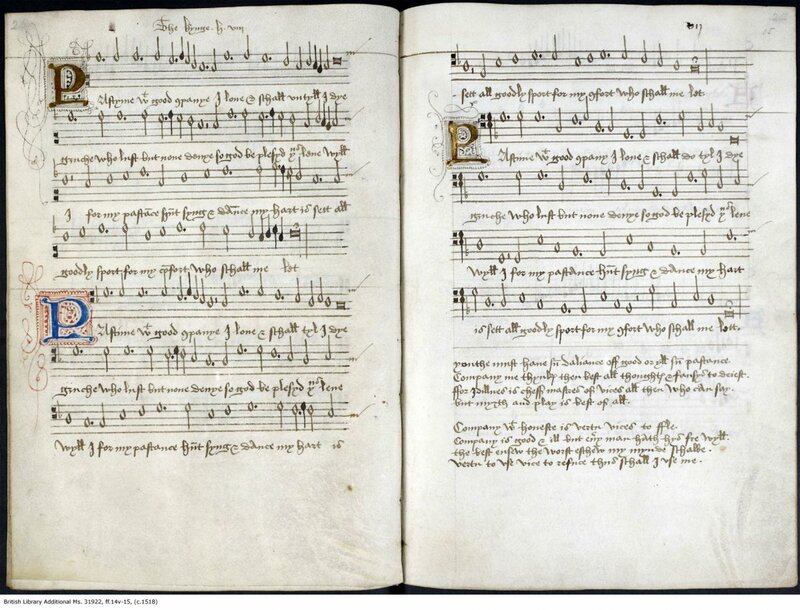 None of the modern transcriptions or recordings use anything other than the first tune. (I think Jethro Tull hint at the second, but it's too jazzed up to use as a source.) The difficulty arises because each of the three verses is written in a different clef. They all have one flat. There are two little squares at the beginning of each line which I take to be a C clef. In the first two verses the relative positions of the clef and the flat are consistent with the tune being in G minor/dorian; but that isn't the case for the third verse. The only way I can make sense of it musically is to treat the bottom line of the stave as the tonic. That's consistent with the position of the flat, but not with what I presume to be the clef. Also this verse has an additional symbol immediately after the clef which I have no way of interpreting. Can any one with greater knowledge of these things help me out? Did our great King Henry VIII simply make a mistake? This is just written as three-part harmony. You are correct about the first two clefs - they are C2 and C4 respectively, but the third clef is an F4 clef - notice the diamonds and the vertical line which makes a backwards F... (so it's a normal bass clef). If you just write the three parts out in modern notation (as treble and bass clefs) it will give you an idea of the chords you need under the melody. Ah, I see. That makes sense. Thank you Adrian. Glad to help out LJ. The manuscript has a few other things which might be worth my pointing out to people who are unfamiliar with old notation. The C which corresponds to the C clefs is middle C, or the C underneath today's treble clef and it can be on any of the 5 lines of the stave, with a C1 clef, referring to the bottom line and a C4, the forth from bottom and so on. Likewise the F clef can be either F3, F4 or even F5 and the G clef either G2 or sometimes G1. If you're wondering why they used so many different clefs, it was ultimately to avoid ledger lines which would have used more space on the page. See how each part fits comfortably between the stave. The squiggles with their diagonal lines at the end of each stave indicate the note that's coming next at the beginning of the following line. As you can see there are no bar lines in music from this period.